Teri Madonna and The Bats in The Nomad. Photo by Isaiah Tanenbaum. BOTTOM LINE: A vibrant musical odyssey chronicling the life of a wandering rebel with a rich score and ensemble. Who is Isabelle Eberhardt? Ask and you’ll receive a flurry of contradicting answers. Isabelle is a dreamer. A lover. A rebel. A manipulator. A fool. A criminal. One thing is for sure: Isabelle was here for a moment. She made a commotion. And now she’s dead. From beyond the grave, the enigmatic Isabelle (played with endearing fervor by Teri Madonna) chronicles her journey from her experiences as a young girl in Switzerland (her younger self played by Sydney Blaxill), to becoming a notorious agitator disguised as the male Si Mahmoud Essadi, to her death at twenty-seven. After losing her mother (Glenna Grant) along the trip to Algeria, Isabelle finds herself alone and without an identity. Traveling the desert with only her horse for companionship, she befriends other nomadic French convoys like herself. She soon finds herself in the middle of the French/Algerian riots, drawing notice from the military as well as Muslim students. In order to deflect negative attention for her very vocal opinions and writings, she takes on a male identity. No one can truly define the chameleon-esque Isabelle, not even her lover Slimene (Neil Redfield). Her supporters love her, and her haters want her dead. Boasting an excellent ensemble cast (The Bats), Elizabeth Swados and Erin Courtney’s lyrical storytelling, combined with Madonna’s emotionally arresting timbre, gave me the nostalgic thrill of discovering a unique new musical. 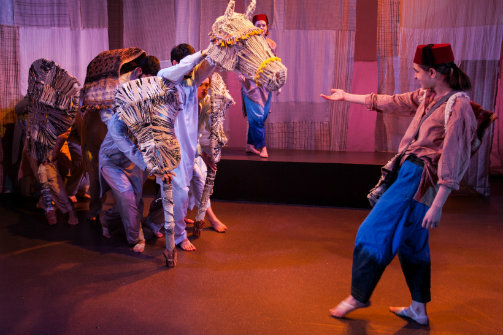 Directed by Swados and Molly Marinik, The Bats use shadow play, puppetry designed by Lydia Fine, and dazzling choreography by Ani Taj to make the desert come to life. I found Isabelle’s horse (a combination of puppetry and human sculpture) to be particularly riveting.